It's been a few months coming, but today I'm ready to announce the first shipment of the new Empire State Cellars Wine Club. If you're not familiar with the club, read more about it here. We've added a fourth club type -- Excelsior -- which can be purchased as a standalone club or added to another club. Those wines will be up to $60 each and the focus for me will be picking wines worthy of your cellar. Here are the wines for this first shipment. Each is more than welcome in my glass and I hope you'll enjoy them as well. Red Newt Cellars 2009 Davis Farms Vineyard Riesling: Winemaker David Whiting makes a wonderful range of riesling styles, including a handful of single-vineyard wines from various growers. This riesling stood out when I tasted it for it's lime and slate flavors with pretty citrus blossom notes sprinkled in, and for a beautiful crackle of acidity that lengthens the finish. Anthony Nappa Wines 2010 "Bordo" Cabernet Franc: If you've been a member of this club for very long, you know how much I enjoy the cabernet franc grape. Well, here is a unique expression that shows a ton of personality for the price. Made using ambient yeast and without a splinter of new oak, it shows complexity and freshness... with a bit of rustic character. Look for snappy red fruit, sweet herbs, sundried tomato and wild fennel aromas and flavors. Ravines Wine Cellars 2009 Argetsinger Vineyard Riesling: If there were such a thing as a grand cru vineyard in the Finger Lakes, Sam Argetsinger's vineyard on the eastern slope of Seneca Lake would surely be one. Take Sam's vineyard and add winemaker Morten Hallgren's skills in expressing its beauty, and you get this wine -- one of the Finger Lakes' top rieslings year in and year out. McCall Wines 2009 Pinot Noir: Pinot noir from Long Island? It's chased by several, but I'm not sure anyone does it better than Russ McCall on his vineyard in Cutchogue. 2009 was a challenging year on the North Fork and one that enabled the best-tended vineyards to shine. Bright red fruits are accented here by subtle oak and and almost floral spicy quality. I always want my pinot noir to be food friendly, and this one fits that bill nicely. Bedell Cellars 2010 Viognier: If you don't see much pinot noir on Long Island, you see even less viognier, but this was one of my favorite wines of last summer. Replete with sweet melon and stone fruit flavors, there are distinct but understated floral and plum flesh -- not the skin -- notes as well. Fresh and focused, the acidity carries peach and melon flavors with it as the finish lingers. Osprey's Dominion Vineyards 2007 Reserve Merlot: Winemaker Adam Suprenant doesn't make reserve merlot very often, but when he does it really means something. It's no secret that 2007 was a hot, dry year on the North Fork, so combine that with Adam's cellar skills and you get a complete, balanced merlot that is approachable now but will also improve with time in your cellar. Hermann J. Wiemer 2010 Magdalena Vineyard Riesling: One doesn't often think about "warm" anything in the Finger Lakes, but Magdalena Vineyard is one of the warmest vineyard sites in the Finger Lakes -- it's all relative remember. Its mesoclimate, along with varied soils, consistently deliver ripe, balanced fruit to the cellar where winemaker Fred Merwarth works his magic, bottled here as a single-vineyard wine. Paumanok Vineyards 2007 Tuthills Lane Vineyard Merlot: The NYCR's 2010 Red Wine of the Year from Long Island, this is a benchmark wine for me -- a wine that I compare many merlots to when I'm tasting them. Yes, the flavors are ripe and layered, but what really makes this wine a standout is its structure. The tannins are substantial and chewy, but also incredibly ripe, providing some serious grip without being hard or harsh. Drink it now if you must (make sure you decant it for an hour or two) but tuck it away in your cellar for several years and you'll be rewarded. In the days leading up to the recent announcement that Delta Air Lines will soon offer daily flights between New York City and Big Flats, Finger Lakes Wine Country President Morgen McLaughlin hinted at a "game changer." Marketing agents are hoping she's right: They believe this new connection will attract new visitors to the Finger Lakes. Daily service between John F. Kennedy International Airport and Elmira Corning Regional Airport will launch in June. One flight will run each day, utilizing a 50-seat regional jet operated by Pinnacle Airlines. Tickets for future flights went on sale last month. Does it change the game, as has been said? The flight is listed as running 90 minutes, though actual air time will be roughly half that. Still, add the drive time to the airport, arriving at least an hour early, and the time required to get baggage and ground transportation, and the fact remains that this new flight doesn't save travelers as much time as might first appear. But there will be new opportunities with this daily flight. Here's why. If you don't live in NYC, that number is probably higher than you realize. According to Census data, 54% of NYC households do not own a car. The number of households that own cars is going up, but slowly. Here's a nice look at how it breaks down. Anyone who doesn't own a car was rarely, if ever, going to visit the Finger Lakes in the past. Now they'll have a better chance to change that. Want to bring a celebrity chef to the Finger Lakes? How about holding a nationally or internationally themed conference? The new argument is: We can get you there easily, with multiple options. We'll see if it pays off. Ann Crook, the Big Flats airport Director of Aviation, has been saying for months that her customers want this flight. In fact, she cites a direct flight to NYC as the number one customer request going back years. Now, in most cases, she's talking about customers who want to be able to fly directly to NYC from Big Flats, not the other way around. But no matter. Crook points out that this will satisfy customers going out, but also customers coming in. Whether this flight changes the game and dramatically impacts regional tourism remains to be seen. We can start looking for the impact with the first flights on June 7. This is the last "Tasting Table" that we'll publish here on the NYCR. Going forward, wines like these will each be reviewed as standalone posts. This is a long edition, but I wanted to get caught up a bit in the tasting notebook and start anew before we get too far into 2012. Atwater Vineyards 2008 Vidal Blanc ($14*): Crisp Granny Smith apple and green melon aromas. Juicy, fresh palate with loads of green apple and pear flavors. Acidity provides good cut and balances the RS well. Simple but snappy and delicious. Bloomer Creek Vineyards 2009 Auten Vineyard 2nd Harvest Riesling ($22*): Aromas of apple blossom, pears, yellow apples, lavender and a bit of Champagne-like yeastiness. Super-ripe fruit flavors -- apple, pineapple, golden raisins and guava -- with grapefruit-y acidity that frames that fruitiness, but doesn't quite focus it. Bloomer Creek Vineyards 2009 Morehouse Vineyard 1st Harvest Riesling ($18*): Unique nose of fig, almond, pear, membrillo and sea shore leads into a complex and ripe palate. Big fig flavors with red apple skin and nutty-salty notes. Some residual sugar, but is balanced by well-incorporated acidity. Unique expression of Finger Lakes riesling. Comtesse Therese 2006 Aquebogue Estate Cabernet Sauvignon ($25*): The nose delivers woodsy, spicy aromas with blueberry, licorice and cherry compote. Cherry cola, blueberry and plum on the palate with quite a bit of cedar and a distinct caramelized sugar note. Decent fruit, but too much oak. Damiani Wine Cellars 2010 Dry Riesling Davis Vineyard ($22): Lemon-lime and river rock lead the way on a pretty, classy nose, with citrus blossom and faint honey notes behind. Grapefruit and lime on the attack with peach and lemon-lime joining the party on the crisp mid-palate. Crisp, dry and a bit bony. Citrusy, slate-y finish. Enough fruit to avoid over-austerity. Dr. Konstantin Frank 2010 Muscat Ottonel ($20*): Classic muscat nose -- floral, candied lemons and Fruity Pebbles. Very floral on the palate with lemon drop candy and pear Jelly Belly. Medium-sweet but not syrupy. Just enough acidity. Probably best on its own or maybe fresh fruit dessert? Dr. Konstantin Frank 2010 Sauvignon Blanc ($20): Varietally correct nose of grapefruit, lemon and fresh-cut grass. Hay and citrus on the palate with light grassiness and sweet grapefruit flavors. A bit dilute on the mid-palate through the medium-length finish. Duck Walk Vineyards 2010 Pinot Grigio ($15): The nose shows aromas of canned peaches in syrup, pineapple and papaya with a lightly floral highlight. Palate shows big acid that is a bit disjointed. Candied peach and tropical fruit flavors dominate with some zesty grapefruit character. A bit citrus pithy on the finish. Duck Walk Vineyards 2010 Rose ($15): Aromas are straightforward with strawberry and cranberry fruit. A bit watery on the attack leading into fruity red berry flavors. Mostly dry with a crisp finish. Fresh, but very one-note. Fox Run Vineyards 2009 Riesling ($14*): Mostly pear on the nose with a little peach and citrus. Friendly style with some residual sugar and good-but-not-electric acidity. Pear and peach fruit flavors and a surprising walnut nuttiness on the medium finish. Hermann J. Wiemer 2009 Riesling Dry Reserve ($25*): Floral on the nose with notes of herbal tea, pear and gala apple. Beautiful laser beam of acidity focuses pear and sweet lime flavors accented by pretty floral flavors. Subtle richness on the mid-palate but that acidity balances the wine very well. Finish is long with lemon and grapefruit citrus flavors. Heron Hill Winery 2009 Dry Riesling ($14*): Delicate nose of hay and flowers. Palate is very floral, almost perfume-y with hints of peach and mango. Great acidity and a faint slate note. Solid value. Lenz Winery 2004 Estate Selection Merlot (*23): Rich nose that displays black cherry, blackberry and plummy fruit with hints of leather, black pepper and earthy spice. Medium bodied, with nice acidity that boosts the medium-soft tannins. Mature mouthfeel. Plummy with blackberry accents and an earthy edge. Medium-long finish with a distinct blueberry note. On day two open, a minty herbal note emerges. Great value. Red Newt Cellars 2008 Curry Creek Vineyard Gewurztraminer ($38*): Lighter floral aromas accent pear, apple and candied ginger aromas with jasime and lychee on a layered nose. Wears it's 14.7% abv very well. Ripe, lush fruit up front with pear and citrus notes. Spice, flowers and lychee support and bring nuance. Mouth-watering finish shows a bit of melon as well. Red Newt Cellars 2009 Lahoma Vineyards Riesling ($20*): Feathery aromas of lime, start fruit and faint flintiness. Definitely off-dry style, but great acidic edge that slices through fresh apple, star fruit and lime flavors. Long, apple-y finish. Well balanced, if just a bit one-dimensional. Red Tail Ridge Winery 2010 Chardonnay "Sans Oak" ($12): Ripe, sweet-smelling yellow apples and starfruit on the nose. Light to medium bodied and very juicy. Apple-starfruit combo on the palate as well, with citrusy acidity and a clean, mouth-watering finish. Simple, but tasty and very well priced. Red Tail Ridge Winery 2009 Dry Riesling ($19*): Juicy pear on the nose with a squirt of lime and a sprinkle of candied ginger. Dry, but not austere, on the palate with good but not quite crackling acidity. More juicy lime on the palate with apple, pear and lime candy. Long finish. Well done. Robibero Family Vineyards 2008 Pinot Noir ($17*): Red cherries, cola, black tea and spicy oak on the nose. Soft and silky palate with low tannins and just enough acidity. Straightforward red berry fruit is a bit hidden by oak, but only barely. Good for the price. Robibero Family Vineyards 2010 "87 North" ($13*): Blend of 50% Cayuga and 50% Vidal. Big honeydew melon aromas on the nose with a little citrus and pear. Pears and melons dominate the palate too, which shows bright, citrusy acidity. Not long, but finishes cleanly with pears and apples. Simple, but fresh. Robibero Family Vineyards 2010 Riesling ($16*): Very peachy nose with subtle floral and lemon-lime aromas. Peach dominates the palate as well with sweet citrus and fennel notes. Off-dry but not clunky or cloying. Good acidity that doesn't quite scrub the palate clean. Medium-short finish that is all peaches. Tousey Winery 2010 Chardonnay ($16*): Taut on the nose with yellow apple and pear, with a bit of butterscotch and caramel apple. Bit dilute on the palate with good acidity. wood is subtle and comes across as caramelized sugar/vanilla. Lacks fruit somewhat. Fresh finish. Ventosa Vineyards 2007 Saggio ($26): Blend of cabernet sauvignon, merlot, cabernet franc, syrah and sangiovese. Nose is surprisingly un-fruity for the vintage with tobacco, dark earth, and oak overwhelming some dark fruit aromas. Lacks fruit on the palate as well. Chewy, tight tannins. Some cherry cola flavor but a lot of oak and earth. Very dry. More fruit emerged on the second day, but by third day the wine had faded overall. Zugibe Vineyards 2009 Pinot Gris ($15): White flowers, pears and apples mingle on the fresh, clean nose. Nice pear and white flower flavors on the palate with a little honey. Sizzling acidity -- almost too much -- and slightly off-dry on the mid-palate. Somewhat short finish but pear skin and orange peel notes. I read an article this week that has me thinking about climate and winter and the Finger Lakes wine industry. We head into Christmas weekend on pace for the second-lowest snow total ever -- as in, ever recorded in more than 125 years -- along with one of the top three warmest Decembers. So with my brain already stuck on the subject of unusual weather, I was interested to hear the take of the wine and science communities on how climate change has impacted other major wine regions. That temperature increase nearly doubles in Spain, Portugal, southern France, parts of California, and Washington State. This last point is significant. The often-quoted magic number is -10 degree Farenheit; that's the threshold when vinifera vines will start to die with any extended exposure. But Lakso explained to me that vines can be similarly shocked (injured or even killed) when the temperature hits zero... if the temperature has fallen, say, 30 to even 50 degrees in a single day or two. The vines would not be accustomed to the cold, and without a little practice and protection (and often without the warmth of a snow pack), bad things can happen. The ideal scenario is a vintage like 2010, which saw budbreak in April. Growers were nervous; they know that an April budbreak leaves buds vulnerable to debilitating frosts. But for the most part, that didn't happen in 2010, and the result was a historically long growing season that gave wine producers plenty of options on ripeness, style and picking schedules. Notice I didn't say that 2010 was "hot." It was simply long, consistently warm. And I think that distinction is where McQuaid might be tripping up, as he puts forward a bit of hyperbole in his analysis. He cites a study indicating that Bordeaux is seeing average temperatures rise too far for white varieties to thrive. By 2049, "No more Sauvignon Blanc" in Bordeaux, McQuaid writes. The data hasn't convinced me that the future is so severe and so close to our doorstep, and longer growing seasons don't always equal hotter growing seasons. But certainly McQuaid makes another valuable point: Longer growing seasons have opened up new opportunities in cool climate wine regions. He mentions Long Island and Canada's Prince Edward County as examples. Certainly the Finger Lakes is another. But before we celebrate, we must remember that the cooler a wine region's climate, the more susceptible it is to vintage variation. Even as we experience longer seasons, there is extreme variability. The glorious 2010 vintage was preceded by 2009, when Finger Lakes winemakers knew by July that Bordeaux red varieties were bound to struggle. And the 2010 vintage was followed by a winter that saw a few of those vertiginous drops in temperature; some Keuka Lake growers experienced serious winter injury as a result. It's too early to draw conclusions regarding what climate change means for wine regions and wine lovers. But by now there is enough data to know that New York State is well positioned for a long, successful winemaking future. After all, the best wines are already earning the world's attention. Longer growing seasons and more options can only broaden the arsenal. Robibero Family Vineyards, which took over the old Rivendell Winery building in New Paltz, NY in 2007, is a Hudson Valley winery to keep an eye on. The Robibero family has planted an estate vineyard and is working hard to breathe new life into the winery and tasting room and has hired Kristop Brown, formerly of Benmarl Winery, to help make the wines. For now the wines are made with fruit and juice purchased in other areas of the state -- a common scenario in the Hudson River Valley. This Robibero Family Vineyards 2010 Dry Riesling ($17) is made with fruit sourced in Finger Lakes and it shows it. Fresh aromas of green apple, lime and juicy pear are accented by a subtle, but distinct, floral note. Fruity and somewhat simple on the palate, this wine is dominated by lime and green apple flavors with subtle honey character. All that fruit is balanced quite well with crisp, juicy acidity -- with a medium-length finish that shows lime and pear flavors. You'll find more complex dry rieslings in the Finger Lakes, but this wine successfully dodges the "lemony acid water" style that underwhelms. Here is yet another delicious Blaufrankisch from the Finger Lakes, with ripe, juicy aromas of blackberry and black raspberry with hints of cassis and a black pepper edge. Showing off the warmth of the 2010 growing season, the medium-to-full bodied palate displays intense red and fruit flavors that remain bright and crunchy because of the fresh acidity. Add a sprinkling of black pepper and you have a wine well suited to the dinner table or your picnic table next to burgers and barbeque. The finish is long shows a certain floral-herbal quality that brings complexity. Seats still remain for what Red Newt Bistro is billing as "the wine and food event of the season." This Friday, December 2, Red Newt Bistro host a special dinner that will raise funds for the new Debra Whiting Foundation. The cost to attend is a $100 donation to the foundation. "Debra was a woman of passion," says Dave Whiting, owner of Red Newt Cellars and Bistro. "We were passionately in love, and she worked, breathed, and lived with a passion. This event is an expression in so many ways of what Debra lived and breathed while she was alive, and for me is a reminder of her legacy that each one of us has the privilege to share." For the menu, Red Newt Bistro chef Brud Holland is teaming with Samantha Buyskes of Simply Red Events and Culinary Center. The money generated by this dinner will help launch the foundation, which has lofty goals. "I can't bear to think of looking at the Finger Lakes as the region that it is becoming without Debra continuing to be a part of it," Dave Whiting explains. "We would have rather had her here in person, but it's essential that the drive and spirit that her life embodied carry on in her absence." Scholarship venues will be offered at local high schools to encourage and fund students who decide to pursue further education in culinary and/or local agriculture programs. An infrastructure will be built to enable and facilitate rich internship opportunities for students enrolled in college or university level culinary programs. The focus of these opportunities will be to bridge the disconnect that often occurs between what is prepared for the plate and where it came from. Connecting the farm to the table builds the appreciation of local cuisine, farms and families. Offered to culinary professionals not currently enrolled in other educational programs. This multidisciplinary apprenticeship will focus on the integration of farm, table, farmer, chef and community. Engaging the apprentice in multiple aspects and situations of farm production, food processing and restaurant preparation will build an appreciation of the “what, how and why” of the locavore approach to cuisine and agriculture. The dinner event begins at 6:30 on Friday, December 2. In lieu of attending this event, the foundation is graciously accepting donations. If you're active in social media channels like Twitter and Facebook, you may have noticed that one of New York's best-known wineries, Dr. Konstantin Frank Vinifera Wine Cellars, has become extremely active on them. That's the work of Erin Flynn, who joined Dr. Frank in May. Erin is a Finger Lakes native but didn't stay home to work in the wine industry right away. After earning her bachelor of arts degree from Nazareth College and as Master's degree in management from Keuka College, Erin moved to Washington D.C. to work in politics and as a lobbyist. As you're read below, that just wasn't meant to be. I am one of those people who thought I knew what I wanted to be in life only to discover that I was meant for a different purpose. Believe it or not, I began in politics. After my undergraduate education, I moved to Washington, D.C. where I was first a legislative intern for Senator Chuck Schumer and later a registered lobbyist. I guess some things in life are just meant to be. As a native of the Finger Lakes, I was passionate about the region and its wines and discovered that I lost a part of myself when I moved away. Two things were the straws that broke the camel’s back leading me back to the Finger Lakes. First, I fell in love with my husband who is also a native of the Finger Lakes and second, the hustle and bustle and dirty political atmosphere of D.C. caused me to reevaluate where I wanted to be in life. My gut instinct told me that the skills I developed in politics could be translated into a career in the Finger Lakes. On a whim, I decided to “go for it” and heard of a marketing opening at Swedish Hill Winery. From there everything fell into place and my skills blossomed in the marketing arena. Now I have translated those skills into my current position at Dr. Frank Vinifera Wine Cellars. The first bottle of wine I remember drinking was a Rioja while studying abroad in Valencia, Spain. I am still intrigued by La Rioja and hope to one day take a trip through the region. Right now, my favorite wine is our newly released 2010 Gewürztraminer. 2010 was an outstanding vintage in the Finger Lakes and this wine is a brilliant example. Rieslings, gewürztraminer and grüner veltliner are just some of our specialties here at Dr. Frank. Our 2010 Gewürztraminer is loaded with aromas of basil, tangerine, orange blossom and candied bananas. What has surprised you most about being a member of the New York wine community? The collaborative nature of the Finger Lakes region in particular has surprised me. I feels good to be part of a community that is working towards a unified goal. For me, that feeling is magnified by working at historical Dr. Frank Wine Cellars. I am still in awe working here daily and seeing how Konstantin’s legacy has played out in the New York wine industry. probably has something to do with my Irish heritage. I have yet to meet a wine and food pairing that I don’t enjoy. Even if I don’t like particular style of wine, I appreciate that wine’s attributes. I’m a real foodie, so I will eat almost anything. Add a glass of wine with that food and I’m a happy camper. The ultimate wine drinking experience for me is sitting down with my friends in the Finger Lakes wine industry who are equally passionate about wine. Recently, I started a wine tasting group for female Finger Lakes wine professionals. We try to meet once a month and feature a different wine each time. Each person has to choose a region and then we blind taste through all of the bottles. My rule of thumb is that we have to include at least one bottle of New York wine in the tasting. As a group we have learned a lot -- particularly how our regional wines compare to other wines in the world. There is so much to learn from a single night of tending bar. On a recent Saturday, I was one of several bartenders for a charity fundraiser in Rochester. It was a farm-to-table event put together by the fine folks at Breathe Yoga, and it featured local food and all Finger Lakes wines. I recruited the wine donations, then tended bar myself. Here's what I learned. I divided the red wines into two main groups: lighter-bodied reds (mostly pinot noir) and bigger-bodied reds. Pinot was popular, but many consumers just wanted something dark. The surprise smash hit of the night was Keuka Spring Vineyards' 2010 Miller's Cove Red, which poured the darkest color of the many wines we featured. It was gone quickly. Only once did someone taste a Finger Lakes red and decide they didn't want it. These were, for the most part, not discerning customers; they just wanted a standard red. This is not typically a regional strength, but it says something about the quality of the winemaking when consumers are almost uniformly satisfied. Him: I'd love a zinfandel. Me: These are all Finger Lakes wines, and these producers don't specialize in reds quite that style. Him: Oh, gotcha. Then I'll take a malbec. I don't bring this up to poke fun. I think this is a symptom of the pernicious by-the-glass lists that plague this country. So many restaurants serve a shiraz, or a zin, or a merlot. No other information for the customer needed. 3. Many casual consumers still assume that riesling means "sweet"
Over and over, when I mentioned there was plenty of good riesling, people would say, "Okay, but do you have anything that isn't quite so sweet?" This opened up a nice window for conversation and education. But I was surprised that riesling still carries a training-wheels stigma for some consumers. Most people just wanted a glass of wine, and it hardly mattered what we were pouring. But those that wanted to learn really wanted to learn. They were interested in vintage variation, which grapes worked well locally, which producers were strongest, etc. There are opportunities with this crowd, and I hope the wine industry continues to cultivate their passion. As a winery owner and grape grower for over 35 years in the Finger Lakes Region, I have witnessed the growth of our industry from a dozen wineries in the ‘70s to over 100 now. I have also seen the significant increase in tourism in the Finger Lakes. This growth represents a focused and diligent effort to create two of the most viable profit centers, wineries and tourism, in the New York economy. For years, families and friends have united here over the lakes, the land, and the wine – to see it all go away over shale gas drilling – a.k.a. “fracking” – would be a tragedy. Out of my appreciation and dependence upon the lakes, I have implemented sustainable practices in my vineyards – always trying to control the negative impact on the water. This is often times more expensive, and labor-intensive, but it is the sacrifice we make – not just as winery and vineyard owners, but also for our families and friends who grew up here or moved here out of love for the Finger Lakes. In return, our pure waters are priceless for our families to drink from and for recreational purposes. Wastewater produced as a byproduct of fracking can leach untreatable pollutants and radioactive elements into our backyards and into the water. Yes, the gas drillers promised us that our water would not be harmed, but they promised the same to those families in Pennsylvania too – who can’t even drink from their own faucets anymore! The thought of our grandchildren not being able to swim in – or even drink from – these clean lakes is disheartening. These cannot be sacrificed at any cost. Even if the wells were out of sight, the idea of hundreds of trucks using our state and town roads to transport dangerous chemically treated water is unacceptable. These trucks will degrade our roads and bridges, which could result in deadly accidents as our roads are subjected to mud, ice, and snow in the winter and spring months. This is an agricultural region; our local taxpayers can not afford the essential repair caused by this damage. Not to mention, these trucks present the possibility of destructive spills. We all know accidents happen. The wastewater that is supposed to be sent away for treatment and storage could end up in our backyard where our crops and vineyards grow, animals feed, and children play. In addition, these trucks will have a very negative effect on traffic flow and will discourage tourism to our area. Imagine yourself as one of the many who come here to escape the hustle of their daily lives, cruising along our peaceful country roads, only to get stuck behind a truck carrying dangerous wastewater. Tourism has proved to be one of the most prosperous businesses here. People come here to relax, but after the traffic, pollution, and noise that these trucks will bring – there will be nothing tranquil anymore about the Finger Lakes. God has blessed us with a beautiful region, we have built it into a thriving industry, now we must protect and preserve it for ourselves and future generations. We are the stewards of the land; we must persevere with efforts to hold on to what we have. There isn’t enough money, or enough natural gas, to warrant jeopardizing our beautiful Finger Lakes Region. As I patrol the Internet, seeking out information about New York wine and read what to others are saying about it, I see some pretty amazing and curious things. One of the most mind-boggling is the contention by some that Finger Lakes rieslings are over-priced. That's just silly and barely merits discussion, so I will just assume those folks must be very happy drinking a lot of Pacific Rim and Covey Run rielsings from the West Coast and move on. This wine, the Lamoreaux Landing 2010 Dry Riesling, is $13 at the winery and I've seen it of less in wine shops. And in just about every vintage, this is a wine that over-delivers. When I was a kid, we had a gravel driveway. This wine smells like that driveway did after it rained, with added aromas of lime, citrus blossom and green tea. Lively, dry and focused, the palate shows intense lime flavors with grapefruit at the edges and more of that wet gravel minerality. The acidity is juicy and citrusy and the finish is medium-long. Finger Lakes rieslings over-priced? Here's exhibit A against that case. Some Finger Lakes Wineries Favor Synthetic Corks for Their Best Wines; Should They? Serious wine consumers are not, generally speaking, fans of synthetic cork. Most recoil at the sight of a plastic cork being pulled from a bottle they had otherwise been excited to open. Is this bias unfair? Maybe. Companies are working to improve the quality of synthetic corks. We'll get to that in a bit. But there's no denying that synthetic corks make a clear statement to the serious consumer, whether intended or not. "Cheap," said one of the many tasters on the evening of the recent Finger Lakes Riesling Hour. The inaugural riesling launch event led to coordinated tastings around the state and beyond. In Rochester, we had a packed room and it wasn't long before someone noticed that several 2010 Finger Lakes rieslings were closed with synthetic corks. In particular, the synthetic closures on Dr. Konstantin Frank and Rooster Hill stood out at our tasting. We're told that a few other Finger Lakes rieslings opened that night were also closed with synthetic. "I hate them," says Leo Frokic, a downstate wine aficionado. "They let oxygen in. Would never buy anything worth aging that was sealed with synthetic corks." "If I see plastic, I worry," says Loren Sonkin, owner of Sonkin Cellars, which makes California syrah blends. "I won't buy wine to age if I know it is in plastic. I am disappointed in the winery and left wondering why." Synthetic closures are mostly made from petroleum-derived polymeric materials. Essentially, they are plastic. And the types of plastic that synthetics are made of are not good oxygen barriers. While wine aging is a complex chemical phenomenon, it’s generally agreed that oxygen plays an important role in the evolution of a wine in the bottle. Studies consistently show that synthetic closures have a higher oxygen transfer rate (OTR) than cork or screwcap closures. In general, cork, being a natural product, shows the most variation in OTR, while screwcaps are consistently the lowest and synthetics are consistently higher than cork. So let's attempt to answer Sonkin’s question: Why are some of the top Finger Lakes wineries using synthetic corks to close their rieslings? We posed that question to Fred Frank, owner of Dr. Konstantin Frank Vinifera Wine Cellars on Keuka Lake. Frank explained that the price of each individual Dr. Frank bottling determines their use of closure. Their most expensive wines are closed with high-grade natural corks. "In our mid-priced wines, we use synthetic corks from Syncor," Frank explained. "These corks are imported from Germany and the manufacturer claims they perform the best in testing run by a university. In our lower-priced wines, we use synthetic corks from Nomacorc." Frank's decision to base the closure on the wine's price leads to a potential problem. Dr. Frank's 2008 Meritage, for example, sells for twice the price of the 2010 Semi-Dry Riesling. But history suggests that the riesling will outlast the Meritage in your cellar. Synthetic corks offer a significant potential savings, but there are levels of quality with each kind of cork. Natural corks run from about $0.20 apiece up to roughly a dollar. Most wineries tell us that they use natural corks that cost either $0.26 apiece or just about twice that. Synthetic corks can come in around a dime apiece, but the price can rise to the natural cork level for the new, higher-end versions. A winery that produces 10,000 cases of wine annually could save $36,000 by switching from higher-end natural cork to lower-end synthetic cork. Would the wine suffer? Over the long term, almost certainly yes. But again, winery owners know that most consumers don't have a long term. Last year, Rooster Hill owner Amy Hoffman explained why she chooses synthetic cork instead of natural cork for Rooster Hill's rieslings. "(Winemaker) Barry Tortolone and I have discussed this at length," Hoffman said. "The biggest reason is to ensure corked wines are not poured in restaurants that typically don't have good trained staff that may recognize tainted wine. The last thing I want is for some family to drink a bottle of wine that is not right and then judge our wines by that experience." Winery owners have stressed how frustrating it is for them to discover that even a small percentage of their wines are corked, ruined by TCA that shows up in the wine in the form of various off aromas. They also worry that some wines might contain sub-detection threshold levels of TCA, which can mask fruit aromas without being perceived as tainted, so it's difficult for the customer to discern whether the problem is with the cork or with the wine itself. But isn't the problem getting better? Haven't corks improved, making cork taint less likely? Estimates on TCA contamination vary, depending on whom you ask. The cork industry claims that cork taint incidence numbers continue to decrease, and estimate that less than one percent of bottles are “corked”. Critics, meanwhile, claim numbers of anywhere from five to ten percent. In more objective measures, data collected from the International Wine Challenge, where judges are trained to sniff out faults, shows that cork taint shows up in just under two percent of bottles (2006-2008 data). Another point often raised in the Finger Lakes is the fact that the vast majority of consumers are not, in fact, laying bottles down to drink months or years down the line. Most wines are purchased for quick, almost immediate consumption. Why should a winery pay more for natural corks when a synthetic cork will do the job for at least a short while? From our perspective, here's a strong reason to use the best possible closure: You won't effect change if you're signaling to the consumer that the wine should be drunk quickly, just as it always has. Finger Lakes wineries are producing some truly fine rieslings, and year after year, we find new evidence that the wines will age with grace and beauty. Some have even showed the capacity to improve over a decade or more. But consumers are not likely to begin laying bottles down if the message they receive is that it's not worth their while to do so. Change comes slowly, and with persistent consumer education. It's not always the cheapest short-term option that leads to long-term success. This consumer perception of quality based on bottle closure is gleefully referred to by the cork industry as “premium factor.” To many consumers, there is just something special about popping a natural cork out of a bottle. One study of this phenomenon seems to confirm its existence, with consumers showing a strong positive association (e.g., they would pay more) for wines sealed with natural cork. Screwcaps show a strong negative correlation (perhaps a holdover from the Carlo Rossi jug wine days) and synthetics also show a mild negative correlation. Savvier consumers know, though, that screwcaps are not just for plonk, as many high-quality New World wines on screwcap demonstrate. But you don’t see entire countries (à la New Zealand) switching almost all of their production to synthetic closures. In the minds of consumers, natural cork is simply the best possible closure for aging a wine. While the jury is still out on the scientific basis for such a belief, the court of public opinion has long been adjourned. At a recent writers conference, Evan had the chance to see the new lineup from Nomacorc, a synthetic cork producer popular with New York wineries. The lower-end synthetics still look as fake as ever, and their oxygen transfer rates would be trouble for a consumer looking to lay bottles down. Their higher-end products look much more like natural corks than ever before. It's a clean, strong look. How do they perform? For the Nomacorc Select Series, their top-of-the-line product, the OTR is comparable to mid-range natural cork, providing, according to Nomacorc, a shelf life of between six and eight years. At the conference, Evan tasted a series of wines that were several years old, closed under different grades of Nomacorc. On each occasion, he was able to correctly identify which wine was closed under better quality synthetic cork, and which was closed under lower-quality synthetic cork. But it wasn't easy. There are numerous factors that producers need to consider when choosing bottle closures for their wines. Longevity, consumer perception, cost, risk of taint from the closure, and many more. There are also alternatives for wineries who wish to eliminate cork taint. Screwcaps are an option of course, but bottling under screwcap (1) requires a new bottling line (a capital cost many wineries simply can’t justify), and (2) comes with its own share of problems, which are beyond the scope of this piece. Some technical (agglomerated) corks (e.g., DIAM) undergo a special treatment process to remove TCA, but this process also adds to the cost. Then there are a host of other alternative man-made closures like the Zork, the VinoSeal, the Guala Seal, and many others, whose market acceptance and performance as closures are yet to be determined. It's easy for us to prod Finger Lakes producers about natural corks when we're not paying the bills. And if we were producing Cayuga White or Niagara or many other varieties, we'd not spend extra cash on natural cork. That said, this is a region looking for more worldwide respect. This is a region that produces many wines that merit such respect. Most of the top producers close their rieslings with natural cork, but not all. It'd be a shame to see writers and consumers open a bottle and give up on the wine -- or the winery, or even the entire region -- before they pour a glass. Tom and Susan Higgins, owners of Heart & Hands Wine Company on the eastern shore of Cayuga Lake, have worked tirelessly to build a reputation for making what may be New York's best pinot noirs. It's clear that pinot is their passion and it shows in the bottle and throughout their entire operation. But, with wines like Heart & Hands Winery 2009 Reserve Riesling ($29) Tom, who makes the wines, proves that he's not a one-trick pinot pony. This is the Finger Lakes after all, where riesling rules and it seems silly not to make riesling when such high quality raw materials are available. The nose is expressive and concentrated, filled with lime, pear, starfruit, fig and citrus blossom aromas. Intense and concentrated fruit flavors -- apple, graprefruit and lime -- are delivered on a nimble, almost feathery palate with bright, well-integrated acidity that drives it forward and into a long, citrusy dry finish. 2009 was a tremendous year for riesling in the Finger Lakes, and this is one of the best I've tasted from the vintage. Though on the oakier -- and pricier -- end of the Finger Lakes Blaufrankisch spectrum, the Heron Hill Winery 2008 Blaufrankisch ($35) is worthy of a taste when you visit their tasting room with stunning views of Keuka Lake. Not content making a juicy, fruity, peppery wine, the folks at Heron Hill always push the envelope with this grape. At first, the nose seems like it will be dominated by chocolate and smoky oak, but those aromas don't completely obscure those of red cherry, cranberry, black pepper, clove, tarragon and mint. Hefty on the palate, and a bit more overtly oaky, the smoke, vanilla and chocolate character pushes the red fruit to the background just a bit. Good acidity keeps it lively and there is just enough fruit to retain varietal correctnes through the oak. The long finish shows layers of spice, vanilla and just a bit of sweet cedar. This is a wine that makes me wonder what it could be like with just a bit less time in barrel. It has been quiet the wine club front here on NYCR for the last few months. Trust me when I tell you that there's been a great deal going on in the background. We've found a new home and a new name. Today I am excited to announce that our wine club, formerly known as the New York Cork Club, will be reborn on January 1, 2012 as the Empire State Cellars Wine Club, fulfilled by Empire State Cellars in Riverhead. The ESC Wine Club will offer a variety of club options, options that offer flexibility and a variety of price point. But, as always I will still be picking all of the wines -- independently -- which is just one reason that ESC is a good fit for the club. Hello New York: Includes one white wine and one red wine in the $20-and-under per bottle price range. Getting to Know New York: Includes the "Hello New York" selections plus another red and white wine in the $30-and-under per bottle range for a total of four wines every other month. These wines will include a bit more off-beat or harder-to-get selections. New York Wine Trail: This tier and entitles the you to receive both the "Hello New York" and "Getting to Know New York" club selections, plus two selections in the $40-and-under range per bottle. This level will showcase some of the best wines made in the state, as well as rare and library wines. Excelsior: This tier gets you just the "New York Wine Trail" $40-and-under wines and can be purchased separately, or together with the "Hello New York" option. If that weren't enough options, you can also request "All Reds" or "All Whites" in your membership. Empire State Cellars will ship six (6) times per year beginning in January 2012, and the club will renew automatically. 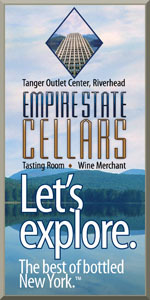 If you'd like to join the club, please call Katherine Jaeger, Manager of Wine Clubs, at wineclub@empirestatecellars.com. The folks at ESC have also let me know that if you call before December 15 to join, they will send you two additional bottles of acclaimed New York wine with their compliments as part of your first shipment! This is going to be a lot of fun for me -- and for you too. I'm working on the January shipment wine picks now and there are some outstanding wines included! The wait is over. Empire State Cellars, a new wine shop and tasting room dedicated solely to New York State-made wine and spirits, will open tomorrow morning at 10 a.m. at the Tanger Outlet Center in Riverhead. "It has been pretty labor intensive to say the least, and mentally draining, but the end result is worth all of the late nights and long hours. This is good for everyone," said Jim Silver, General Manager of Peconic Bay Winery, who is opening Empire State Cellars as second of it s five permissible tasting rooms under its Farm Winery license. Upon opening tomorrow, the store will have 400 different wines and spirits in stock, with the goal of expanding that to 600 in the very near future. "There are still dozens of wineries we want in the store but that haven't gotten back to us yet. Some have been too busy with their harvest to sell us their wines. Some are sold out of certain things we really wan to carry. But that said, we've got an absolutely astonishing selection from all over the state," said Silver. Empire State Cellars will be open from 10 a.m. to 9 p.m. seven days a week, and will offer tastings of several wines every day. I've joined Jim and the Empire State team -- specifically manager Polly Brown and assistant manager Evan Ducz -- as they taste several wines they were considering for the store, and I can tell you that their enthusiasm for finding delicious wines from every corner of the state is obvious, even inspiring. Representing every region and as many wineries as possible is a priority. "We really see this as a way to bring all of the state's wine regions together, to showcase their wines and, of course, sell them. The response has been amazing. Just about every winery we got in touch with is working with us." When I asked Silver what wines he was most excited about stocking, his answer was so long that I almost had to cut him off: "There are some items that just blew me away with their quality and three of them were from Arrowhead Spring Vineyards in Niagara. I'm also happy to have gotten the Bloomer Creek Vineyards wines, some items from Mazza Vineyards in Lake Erie, neat sparkling wines from Swedish Hill Winery, new vintages from Waters Crest Winery and Palmer Vineyards, and single-vineyard wines from Keuka Lake Vineyards, Red Newt Cellars and Lamoreaux Landing. There are way too many wines to list that are very cool." Personally, I'm nearly as excited about the selection of New York spirits, which includes items from Tuthilltown Spirits, Finger Lakes Distilling and Breukelen Distilling. A grand opening celebration is in the works, but has not been scheduled. I'm also excited to report that my wine club, formerly known as the New York Cork Club, will be re-born on January 1 as the Empire State Cellars Wine Club. With the shop's devotion to New York wines, and willingness to allow me to continue picking the wines independently, it was an easy decision to make. I'll tell you more about the new club tomorrow! Dave Stamp, the vineyard manager at Lakewood Vineyards on Seneca Lake, wears shorts every day during harvest, which he says "might be tradition, and it might be just stupid." If it's the latter, then it's one of the only stupid things Dave does in the vineyard; everything else is carefully considered and based on 25 years of experience. That doesn't mean he makes the right call every time, and it doesn't mean every other grower will agree with his decisions. But it does mean that there are few people more qualified to tell the story of this vintage than Dave. Eventually, when consumers taste the best wines of 2011, they might not fully understand just how much work went into their creation. So I wanted to talk to Dave Stamp about how it all went down. By the way, Dave is an exceedingly nice and soft-spoken guy. He'll give you his thoughts, even on controversial subjects, but he never seeks to bring anyone else down. It's occasionally technical and always instructive for me and, I hope, for regular consumers who don't know all the details of growing. NYCR: You've said that everyone will have a "mud story." What do you mean? DS: That was the vintage. Just a lot of rain! As far as getting the fruit off, that was fun. It was muddy. We were down the road in our loading area, and it got so chewed up that turning the steering wheel was just funny. The machines were sliding on the hill, and it was a lot of work to keep the thing going where you wanted it! NYCR: Do you have any fruit still hanging? DS: Everything is in. We didn't feel it was going to be a good late-harvest year. With the rain and pressure, we figured it was better to cut our losses and get everything in. NYCR: The rainy spring cranked up disease pressure, we're told. NYCR: Growers have told us that they had to spray more often this year. What kinds of sprays, exactly? What was your approach? DS: Spring was wetter than normal, which was inconvenient. Summer dried off, a lot of heat, and we were smiling for a while. But we knew there would be disease somewhere after the spring. In September we had way too much rain. We had some splitting problems. But we think we kept the lid on it pretty well. There was botrytis out there this year, but I think everyone was more scared of the sour rot. That was the concern this year. When you get that much water, the berry gets wet, and it pumps that water up, and the skin can't handle it. It splits. Then you get sour rot in there. You can't have a lot of it before it really starts to affect the wine. So a lot of our sprays come in the summer, and we try to back off closer to harvest. We start spraying when the buds are two or three inches long, and it depends on the year. We have two major diseases: powdery and downy mildew. If you can control them early, then you don't have to spray so close to harvest time. We try not to spray near harvest, cause we don't want to put it out there in the vineyard, but this year we had to do it a bit. Often we're done spraying by mid-August. In a dry summer we might not spray at all. This year we had to deal with botrytis. We use sulphur for powdery mildew. It's a very nice product, very old, and it works. We also use newer stuff like Pristine and Resis, which attack proteins in the cell wall, and destroy the fungus that way. Those are prone to resistance, so we use them sparingly. Captan is good for downey mildew. It's a product that serves as a workhorse. There's Abound, which is a sterile inhibitor. It kills a lot of different diseases, black rot, powdery mildew. NYCR: Is this the kind of vintage that affirms many growers' belief that organic viticulture can't be done in this region? DS: You don't see organic growing around here. And somebody could be organic, and it doesn't mean they don't spray. It's just a different set of products. They're a little limited in what they can use. Some of the stuff they're putting on has not been tested like we test regular pesticides. I don't think that's a great idea. In the end, I think it's better to go with a mindset we call "sustainable." Look at the whole picture of things and choose the product that will work best for you with the least amount of side effects. NYCR: Were you able to pick on dry days? DS: For the most part, we picked when it was dry. We were fortunate that when we got the big rains, the stuff that was prone to rot, it was inside the harvest window, so we went ahead and picked them right before the rains. My brother would have preferred another brick on the riesling, sure, but we made the decision to get it in and avoid rot. That's the compromise. Just something we had to do this time around. NYCR: We had two dry, warm stretches, two windows during harvest. One was in late September, the other in early October. How significant was that? DS: Those two-dry stretches helped us out a lot. No question about it. We weren't getting high brix, but the acids still were down. Low acid, low brix, and the flavors came through. Things balanced out nicely. In the end, I think people will be happy with this vintage. NYCR: With the experience you've gained, do you see a difference between hand picking and machine picking? DS: Well, we hand pick pinot noir, and just about everything else is machine picked. When you hand pick something, it sits on the ground, and it's there for a good chunk of the day before anything happens with it. When you machine pick it, it's often on the press within the hour. For me, it often boils down to what you've done in the vineyard. At the end of the day, I'm just not seeing hand-picked wines win all the awards. The machine-picked wines win lots of awards. The newer machines picks things a lot cleaner than they used to, so what matters most is whether you've done the right things in the vineyard. NYCR: Are you glad it's over? DS: (laughs) Well, it was a good-sized harvest for us, a lot of fruit. It was a lot of work! But maybe that's just grape-growing in the northeast. There are other single-vineyard riesling programs in the Finger Lakes, but Lamoreaux Landing Wine Cellars was among the first wineries to enact one. It's a part of their portfolio that I always find fun and educational to explore and topping at out at $20 per bottle, it's probably the most affordable site-to-site exploration available. Lamoreaux makes three labeled single-vineyard rieslings and their reserve riesling comes from another single vineyard. Lamoreaux Landing 2010 Yellow Dog Riesling ($20) comes from one of the winery's youngest vineyards, planted in 2007, and opens with aromas of grapefruit, peach and sweet orange peel. Showing the warmth of the vintage, the fruity palate is on the richer side of things, showing more grapefruit, orange and apricot flavors. There is definitely some sweetness here, but crunchy acidity slices through it nicely. The finish isn't particularly long, but brings a subtle floral note that adds complexity to an otherwise straight-forward wine. Honestly, I drink them all year, but with the weather we've been experiencing, we are decidedly in the midst of cabernet franc season at my house. A combination of the weather cooling and the changing local, seasonal vegetables available have meant more root vegetables, more stews, and more roasts on our dinner table. As a franc fanatic, I often reach for cabernet franc with these foods. Rooster Hill Vineyards 2009 Cabernet Franc ($25) is a wine made for rich foods, particularly those with bacon or another smokey element. Red cherries and pomegranate molasses aromas are made more complex by notes of brown spice, milk chocolate and high-toned floral aromas that are almost overwhelmed by smoky, bacon-y notes. Plump and surprisingly full-bodied, the palate is fruit driven -- a melange of red berries -- with a smokey hint of bonfire and a subtle meatiness that delivers a certain umami quality. There is more structure here than what is found in many 2009 Finger Lakes reds, and also well-incorporated, slightly tart acidity on a medium-length finish. I wish the oak were toned down just a bit, but this is still a well-made, concentrated cabernet franc that is deserving of much more attention. These are tasting notes for some wines that have been tasted at the NYCR tasting table but won't be reviewed in standalone posts. 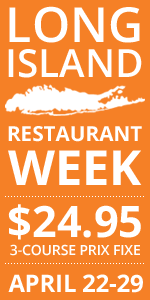 Starting next week, we'll be back with daily standalone reviews. Eleven Lakes Winery 2008 Boat Landing Cayuga ($14): Browning/bruised apple aromas with some peach and a chlorine-y chemical note. Not overly interesting on the palate. Pear and white grape that are less oxidized than the nose. Residual sugar is very well balanced, just not much in the way of flavor. Eleven Lakes Winery 2008 Chosen Spot Dry Riesling ($18): Extremely citrusy on the nose with lemon-lime and just a little flinty quality. Borders on citrus-water style of Finger Lakes dry riesling. Mainly lemon-lime with a little boney, flinty character. Good acidity. Simple, but clean and fresh. Lacks character though. Eleven Lakes Winery 2008 Stoney Place Semi-Dry Riesling ($17): Classic regional combination of peach, lime and river rock on the nose. Good acidity and balance on the palate with flavors that match the nose precisely. Shows nicely focus and length, but has a weird medicinal note on the finish. Otherwise, very classic and well done. Inspire Moore 2009 "Lust" Pinot Noir ($28): Sweet strawberries and raspberries on the nose with subtle earthiness. Medium-light body with restrained red fruit backed by supporting earthiness in the form of muchrooms and stemmy qualities. Soft, but not flabby with just enough acidity and silky, low-grip tannins. Long finish. Nice effort from a not-great year for pinot. Inspire Moore 2010 "Love" Semi-Dry Riesling ($17): 2.5% RS. Peachy nose with grapefruit and hints of honey and lychee. Mouth-filling with some noticeable sweetness but just enough acidity for balance. Ripe vintage shows with fruit intensity -- peach and grapefruit. Finish is abrupt. Pleasant and very Finger Lakes in style. Lamoreaux Landing 2010 Semi-Dry Riesling ($13): Apple-driven nose with a juicy squirt of lime. On the friendly, forward palate, a bit of grapefruit joints the apple-lime party. Shows its residual sugar, but not in a sloppy way. Medium-short finish. Simple, but fresh and well-balanced. Lieb Family Cellars 2010 9/11 Memorial Chardonnay ($19.11): Very light nose with subtle apple, papaya, orange peel and pineapple aromas. Great acidity, but not huge on flavor. Tropical with pineapple and papaya with a bit of nutty vanilla. Macari Vineyards 2010 Rose ($15): Blend of merlot, cabernet franc, cabernet sauviginon and malbec. Juicy watermelon, strawberry and big cherry aromas with light sweet herb notes. On the fuller-bodied side with gobs of ripe, drip-down-your-arm watermelon and a burst of crunch red berry flavor, including slightly candied cherries. Shows vintage ripeness with maybe a bit of heat, but has great acidity. Bold but balanced and well suited to your season's last barbeque. One of my favorite 2010 Long Island roses. Raphael 2010 Chardeaux ($22): 66% chardonnay, 34% sauvignon blanc. Fruity, almost fruit-cocktail nose shows ripe pear, ruby grapefruit, melon with subtle tropical fruit too. Medium-light body, with lots of melon and pear flavor and a bit of citrus zest. Could use a bit more acidity but has a saline edge that I like. Ventosa Vineyards 2009 Chardonnay ($18): Toasty oak (rather than raw) dominates, hiding much of the tropical fruit aroma. Lots of sweet, toasty oak on the palate as well, but also good acidity. Fruit is somewhat candied, with bubblegum vanilla sweetness on the finish as well. Not enough fruit to stand up to the wood. Zugibe Vineyards 2008 Pinot Noir ($18): Red cherry aromas are accented by hints of star anise and toasty oak. Fresh on the palate with red cherry and raspberry fruit and light caramel/vanilla flavors. Not complex or exceptionally long, but clean and fresh and well-priced.